I know what you are thinking. You are thinking it is Thursday. But there was a Monday holiday so I didn't get mail. So Tuesday was like Monday so today, Thursday is Etiquette Wednesday. This book is a wonderful “twofer” -- a hostess book and an abecedary. What could be more delightful! 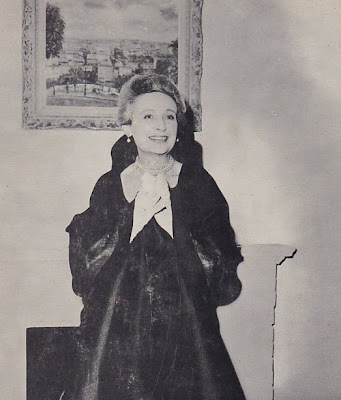 Madame Dariaux was the director of the couture house of Nina Ricci in the late 50’s and early 60’s. The book takes you on a alphabetical romp from Acquaintances to Zoo’s. Pick a situation and Madame Dariaux covers it: Bores, Caterers, Dutch Treats, Faux Pas, Gifts, Kissing, Napkins, Surprise Parties, and Yachting to name just a few of the topics covered. “It is one of the minor ironies of life that today, when more people than ever before have the means, the time, and the urge to entertain, it has become practically impossible to find household help to cope with the extra work that entertaining inevitably entails. 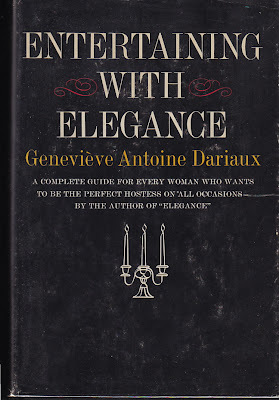 If you can’t find that maid or cook, track down a copy of Entertaining with Elegance. Even if you are not planning to entertain, you will thoroughly enjoy this book and it will become one of your “indispensable” volumes. Presumably you know she wrote a book A Guide to Elegance and Kathleen Tessaro wrote a novel based on that book? Both are good, the former because of the author's writing style more than the somewhat dated content; the latter is just an entertaining story.